The Jean Mayer Human Nutrition Research Center on Aging has teamed up with Chef Andoni Luis Aduriz to transport you to San Sebastian, Spain, through flavor and visual food flair. 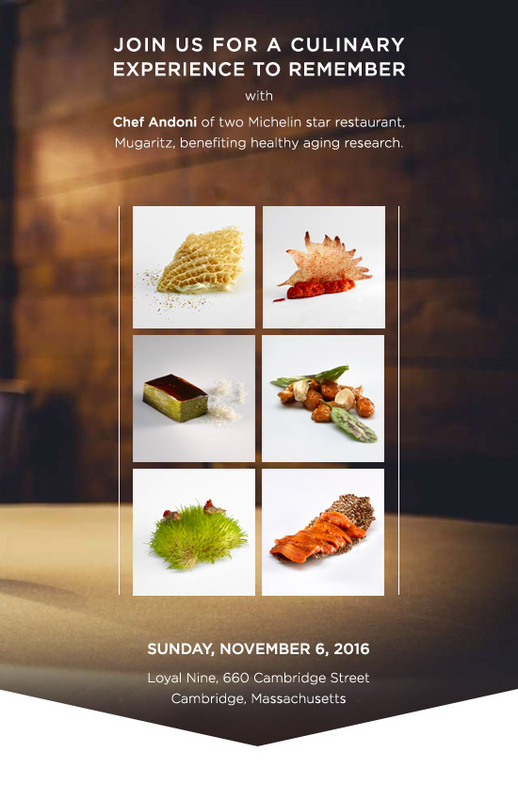 On Sunday, November 6, Mugaritz joins forces with critically acclaimed local restaurant, Loyal Nine, for a mouthwatering, visually stimulating dinner in support of research for healthy aging. Loyal Nine, named both one of Bon Appétit and Eater’s best new restaurants for 2015, has become known for its high quality, unique ingredients, many of which the team cultivates or creates themselves. In preparation for this one-of-a-kind dining experience, James Beard semifinalist Chef Marc Sheehan and his team will source the best ingredients from Loyal Nine’s network of farmers and fishermen. Come November 6, guests will enjoy the restaurant’s commitment to hospitality as they indulge in Aduriz’s exciting menu. More than a meal, it will be an experience to remember.